This striking monument on the edge of the Blackdown Hills Area of Outstanding Beauty, stands as a tribute to the Duke of Wellington and his victory at the Battle of Waterloo. 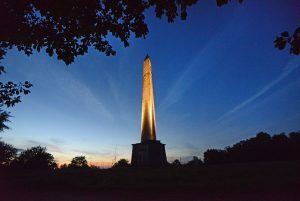 At 175 feet, Wellington Monument is the tallest three-sided obelisk in the world. The foundation stone was laid in 1817 and it was finally finished in 1853 after more than three decades of building work. It is no doubt and impressive landmark but the Wellington Monument is in need of substantial repair. Blackdown Hills AONB is doing what it can to support the National Trust in securing the future of this historic structure.